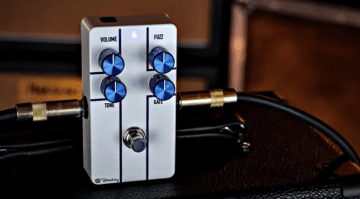 Keeley pedals have just announced four new pedals they are showing off at WInter NAMM. 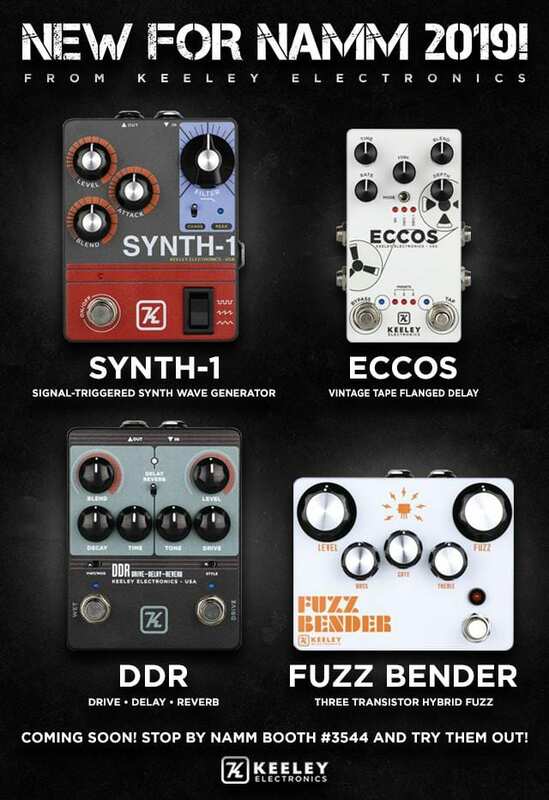 The new Synth 1, DDR, Fuzz Bender and Eccos all have a really nice retro look to them. Knowing Robert Keeley’s work, I reckon they will sound as good as they look too. 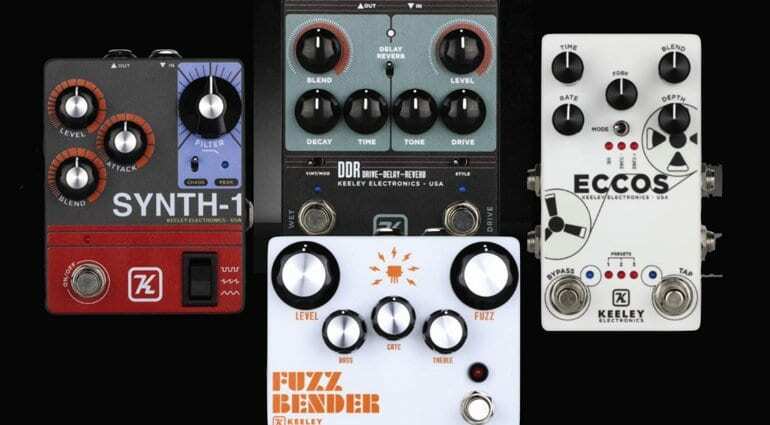 The Synth-1 is a signal-triggered synth wave generator, the DDR is a Delay, Drive and Reverb, the Fuzz Bender is a three transistor hybrid-fuzz and the Eccos is a vintage tape flanged delay! At this moment in time, the full details and prices are not yet listed on the Keeley website, so you will need to head over to the Keeley Stand 3544 at Winter NAMM to check them all out. What I can tell you is that the Synth-1 has controls for Level, Attack, Blend and Filter, plus a switch labelled Chaos. Then you have a three-position Wave Shaper rocker switch that lets you select a waveform. Keeley call the pedal a Fuzz Noise and Chaos Creator! The DDR is essentially what its name suggests – drive, delay and reverb. 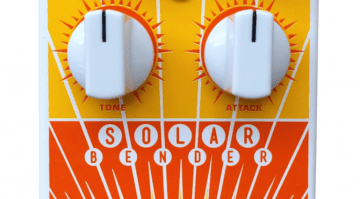 It has controls for Blend, Decay, Time, Tone, Drive and Level. Plus a Vintage/Modern switch for the delay/reverb sound and a Delay/Reverb selector switch at the top. There’s a Style selector switch for the drive side toggles between Rich and Deep British amplifier voicings. This five-knob hybrid fuzz pedal has a Germanium transistor and can do all manner of fuzz tones including gated fuzz styles. The controls are labelled Level, Bass, Treble, Gate and Fuzz. 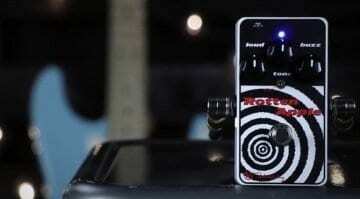 Looks like my sort of fuzz pedal, this one. 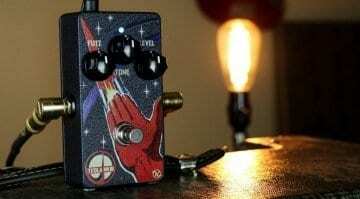 Last up is the Eccos pedal. This one simulates that old tape delay flanging effect we all love. It is Stereo In and Out, which is great! It has controls for Time, Rate, Blend, Depth and FDBK, plus a Mode switch for choosing the voice width. There’s a tap-tempo footswitch, too, but you can use it with an external expression pedal as well. You can also have the trails or bypass them completely when it switches off. It all sounds pretty epic and, again, it’s stereo!